Last Wednesday, before the mall's official 10 a.m. opening time, the early morning mall walkers had already been churning up the white tiles for several hours as they did laps tracing the mall's inside perimeter. The big gate to Kohl's was rolled up, revealing a bright interior and a sea of boxes swarmed by freshly trained workers and their eager managers. Some stretched noisy packaging tape around massive blocks of boxed inventory, then carted them down to the overflow room in an empty storefront elsewhere in the mall. Others unpacked merchandise and settled it onto shelves. Clipboards and lists and directions and bustle. But you couldn't take a picture: Corporate doesn't allow its store to be photographed until everything's shipshape and perfect, said store manager Jucille Barnes. 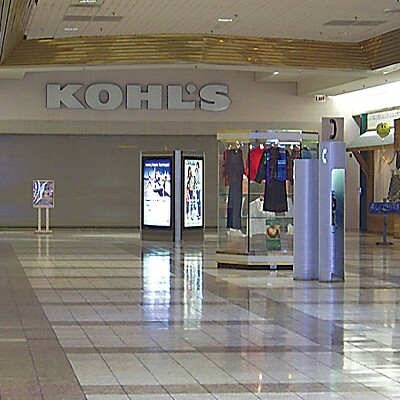 The Kohl's photo op wouldn't be until opening day, Sept. 27 -- this Sunday. And not only shall perfection and light then reign in this dark corner of the mall, but elsewhere inside the sprawling indoor behemoth at 3300 Broadway the other merchants will heave a huge sigh of relief and look suddenly 10 years younger. But otherwise there's nothing between the gaping darkness where the big anchor once was and the still-breathing part of the mall, except for blank faux walls fronted by soda machines, empty storefronts and the currently shuttered Eureka Police Department annex. Out in the rest of the mall are more dark gaps where shops -- some of them major chain stores, like The Gap -- have been yanked out like rotten teeth. And there's the massive hole left by long-time anchor Gottschalks, which went bankrupt, quit the business and skedaddled this year, just like Mervyns. In all, there are about 75 open stores and 20 or so empty spaces. And when you consider that General Growth Properties -- which owns most of the Bayshore real estate (not the Gottschalks space, nor Kohl's') and 199 other malls -- is itself in the throes of bankruptcy, well, all might very well seem lost for this bulky fortress of consumerism. 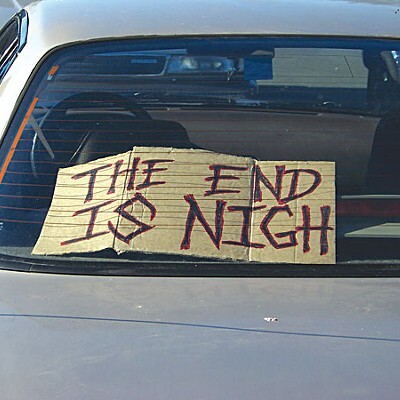 As a penned sign in the back window of a car in the mall's parking lot said last week, perhaps "The End Is Nigh." Except for that breath of fresh air brought in by the new Kohl's. Unless it's just a dying gasp. Yeah, maybe we should level the old gal and build something new, chic, open-air and modern for shoppers. Or put in a park -- my god, the bay and a could-be-lovely but now trash-beriddled marsh are right there. Or, alternatively, install some low-income housing and social services. What do we want? Do we need the mall? Do we use it? Do we want it to stay the same? And what about that church? You know, Calvary Chapel, across from the Boot Barn and Gianni and next door to the Dollar Tree. Is the mall going in some bold new direction? 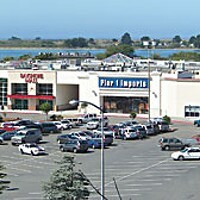 The Bayshore Mall sits on land formerly occupied by the Wiyot people, who were doing splendidly until the whites came along in 1850. By 1853, Fort Humboldt was established near there to presumably protect the whites and Wiyot from each other. But the fort clearly was an exploratory tentacle of the new power that was extending "America" into the so-called wilderness. Eventually Wiyot civilization was all but wiped out. Ulysses S. Grant, who was to become the famous Civil War general, spent a miserable few months at Fort Humboldt in 1854, pining for his wife and children, hating how the damp cold made his joints ache, and now and then -- it was said -- going on a galloping drunken tear down Broadway. "Grant passed the days going into town, playing cards and stopping for a drink at a local saloon," writes Brooks D. Simpson in his book Ulysses S. Grant: Triumph Over Adversity, 1822-1865. "...Life at Fort Humboldt alternated between monotony and boredom, broken only by outbreaks of loneliness and depression." The fort eventually closed, and piece by piece disappeared. The Holmes-Eureka mill arose, where in 1935 a prolonged workers strike led to several workers dying when police fired into their gathering. And then, in 1987, the shiny Bayshore Mall opened, built on the ruins of the old, closed mill. Hordes showed up for the event, forming lines that snaked all the way down to Laytonville and up to Brookings, Ore., to hear some people wag about it. Trumpets blared, angels descended on billowy clouds to welcome Americaland. The biggest circus yet had come to town, it reeked of Big City, and it was here to stay. Perhaps the site's troubles were over. At 8:30 a.m. last Wednesday, the mall had already been open for an hour and a half. None of the stores were open -- that wouldn't happen until 10. A woman's melodyless soft-pop wail oozed in an endless loop from the mall speaker system, but it would be awhile before the corridors filled with the scent of cookies and pretzels. The food court restaurants were waking up, although Burger King had opened first thing so that regulars like Darrell, Harold, Arnie and Rod could get their coffee. These guys -- they wouldn't give their last names -- sat at a table playing pinochle, bathed in the morning sunshine pouring through the gigantic windows of the mall's main, food-court entrance. 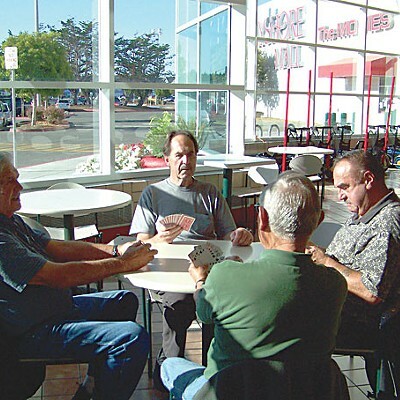 They've been coming to the Bayshore for seven years, about, to walk, play cards and B.S. "I get here at 6:30, and Harold and I walk outside," said Rod. "Arnie and I get here at 7," said Darrell. "And we usually play ’til 9 or 9:30." "Six days a week," said Rod. "And then we take Sunday off." "The only place I shop is Sears," said Darrell. "Gottschalks is closed up," added Arnie. "The best time to get here is in the early morning -- you get to shop, but nobody's open," half-joked Harold. At another table, an old woman sipped coffee and read the paper. A middle-aged woman sat reading a book at another table. A janitor swished his broom, rolled his cart. Out in the main, broad corridor of the mall, a security guard stood outside the Bounce-A-Palooza. She was studying the missing children posters that the store's manager had put up in the window. Several walkers strolled past, including Nancy and Glenda. Nancy's been walking laps in the mall for 20 years. Glenda's been doing it for 15. They said they've seen a group of new moms who come in about mid-morning to do stretches and push strollers. "It's level, and temperature controlled," said Nancy. "I don't have to be bundled up in scarves and gloves. No umbrellas." They do three laps, which is two miles. "And then we sit down and have a cup of coffee and solve all the world's problems," Nancy said. They both laughed. "Nobody knows we're doing that, apparently, because the world's still having problems." Nancy said she was happy when the mall opened in 1987. "It was so much easier to shop when everything was here, you know," she said. "You didn't have to worry about going downtown to different stores." "I hope they don't tear it down and build something else," Glenda said. One Wednesday evening inside the Calvary Chapel Eureka, a couple dozen people sat in the wine-colored chairs facing the stage where a young man and woman on guitar and conga sang, "I love, I love, I love your presence. In the depths of your love I find peace, makes me whole." The congregation joined them, reading the lyrics off of a big screen. Some people sipped on tall to-go sodas or coffee. When the music stopped, mall sounds floated in: kids playing on the plastic playground right outside the entrance, where a plastic dog on a fake hotdog cart giggled maniacally; the wailing lady in the speaker system. Then Pastor Glen Mustian embarked on a three-chapter session from the Book of Numbers -- all about Balaam and how his love of money caused him to fail God. Up on the screen drifted the words, "For the love of money is a root of all kinds of evil." By the time the service was over, around 9 p.m., the mall was closed, the lights dimmed and the shoppers all gone. Churchgoers exited through the door by Ross. A couple of weeks later, midday at the mall, Mustian sat in the church's cafe area and explained how they'd ended up there. For the past 10 years the church has met in the poultry and rabbit barn at Redwood Acres. But every June they've had to move out for six weeks to make way for the Redwood Acres Fair. Plus, they were outgrowing the space; the congregation's grown from 40 people to nearly 240 in less than three years. They plan to move into the old church building at Wabash and Union, but in the interim they need a spot. Mustian said he asked mall management a few times if they could rent a space in the mall, and was declined. But after General Growth Properties filed for bankruptcy in April, the answer became "yes." They moved in in June. "It's different," he said. "Kind of like a fish tank, you know -- people will walk by and just stop and stare in. It's neat though. And it's good for outreach. People are coming to the mall for a great many things. They want to buy things that they don't really need. They want to fill themselves up with food and drink that they don't really need. And we're selling the truth, something that fills you and fulfills you, rather than just stuff." But, yeah, the maniacally giggling plastic dog in the play area outside the glass storefront is annoying. And he has to keep his church noise down. "I'm an old rock ’n' roller so I'd like the sound to be really loud," he said. "When I'm worshiping the Lord, it's always easier for me if the sound is up so loud I can't hear myself sing. But we can't do that here, because the sound goes right out that door, right into the Boot Barn and they get upset about it. And we don't want to make them mad, we don't want to upset their customers." One of the owners of Gianni, a locally owned men's clothing store next to the Boot Barn, said he's heard people cuss at just the sight of the church in the mall. He admits he'd rather see another store there, to attract shoppers. 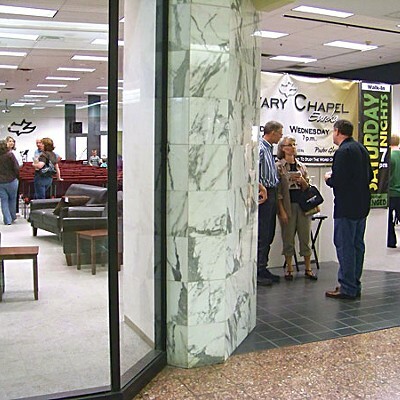 "The mall is no place for a church," he said. "Maybe next there will be a mosque." Mustian's heard the complaints. But he's heard more comments along the lines of, "'Praise the Lord, man, there's a church in the mall!'" he said. As if on cue, Sam Trumbull, of Arcata, walked by with a pair of floormats he'd just bought at Sears. He stopped, and came in the church to check it out. "This is convenient," he said. "It's close at hand -- like a drop-in Christian moment." Mustian said every Sunday morning his church brings 200 people to the mall who wouldn't normally be there. "Service is done at 11:30, and they go to the food court and to the Hometown Buffet," he said. "I've seen groups of them with shopping bags." Some people grumble that the church and other non-retail operations -- like the new nurse training center run by College of the Redwoods, next to Borders, and a Humboldt County Office of Education site -- and even all the locally owned little shops are all signs the mall's on its way out. Robin Moberg, who owns The Treasure Trove -- a new crafters gallery which briefly languished in an out-of-the-way-spot in Old Town -- said she came to the mall after she received an invitation in the mail from Bayshore and was given an offer she couldn't refuse. But Bayshore manager Sue Swanson, sitting at her desk one day last week, said the mall's always had local vendors. Right now, about 30 percent of the mall's stores are locally owned. 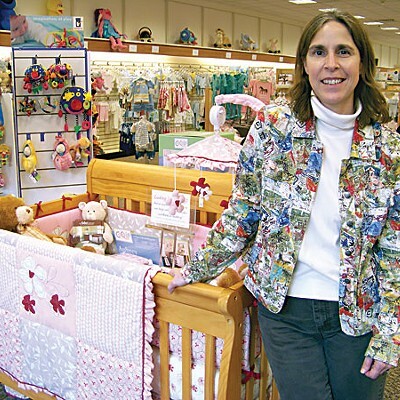 There's Sandy and Doug Powell's two shops, 9 Months Later and Toy Barn. There's the Treasure Trove. There's Irv's Big N Tall, barely a month old. And more. "We have two programs," Swanson said. "We have a national program, which is our permanent leasing program -- chains. And then we have an incubator program. We call it our temporary leasing program, and it is a way to help businesses incubate. Let's say someone has always had a desire to open a store, and so they do the research, figure out what it would take, and we work with them and find them a space we think might work for them, charge them a little less rent and then they have a chance to really try out their concept and get it to grow." If they do well, eventually they become permanent and start paying a percentage of their profits to GGP. But if a chain comes along before that and wants the space, the incubator's out. Swanson said the mall isn't going to close, or change into an outdoor-oriented mall the way Eureka Mall did awhile back -- as far as she knows; the bankruptcy leaves everything open to speculation. "We have rain, and we deal with fog, and it can be cold out," she said. "I think the mall will always have a place. I know that there's a big debate about what's the future of malls and bricks and mortar stores, and I think, yes, we all shop on the Internet, we all shop by catalog. But honestly the catalogs have been around for a long time and bricks and mortar has survived it. Internet can be convenient. But there's still people that like to touch what they're buying, and don't want to go through buying it and returning it and they would rather go down and try something on and just have the immediacy of shopping." 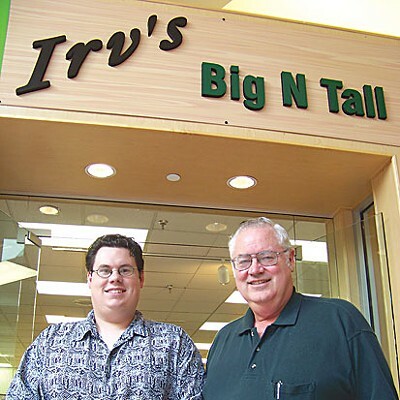 Inside the brand new, locally owned Irv's Big N Tall last week, former pulp mill workers Mike Irvine and his son Shawn waited for business to pick up. Mike worked in the pulp mill for 32 years, until it closed last year, working his way up to machine tender in the room where they turned the pulp slurry into sheets. Shawn worked at the mill for six years, working his way up to digester operator, the second-highest job in the bleach plant. Their decision to open up Irv's was, they admit, an act of desperation. "Literally," said Mike. "There's no jobs available, I've got doctor bills and an insurance premium, I'm going bankrupt -- so, this is it. I either make enough to make my insurance premium, or end up on welfare." "This way, it'll just happen faster," joked Shawn. Actually, said Shawn, business hasn't been that bad. "We get at least a dozen people in here every day who say, 'We're so glad you're here,'" said Shawn. "Only, they don't necessarily buy anything." "We're hanging on right now," said Mike. "At the rate we're going we might break even in the first quarter. Which is good." They figure they've got a shot at success -- no other stores carry the big sizes they do. Mike, who "rides about a 3X," and Shawn, who's a 2X, said most stores only go to extra large. Irv's clothes start at medium-tall and go up to 4X. Or 6X or even 10X, if necessary. They also figure the mall provides the best exposure. They just hope more businesses fill the empty spaces around them. "We've been waiting like crazy for Kohl's to come in," said Shawn. Elsewhere in America, remarkable transformations have occurred with some of these old-style malls. Some have been ripped open and converted into airy live-work-shop places. Others have opened their arms to farmer's markets. And some, sadly, sit loomingly vacant or have been replaced by a large excavated hole -- like the spot where GGP's Cottonwood Mall near Salt Lake City recently stood; the company had big plans to build anew, but then the economy tanked and it went bankrupt. Yet others have slowly evolved into these quasi town-like environments where the shopping limps along, occasionally breaking into a jog, slowly losing its youthful gleam. Which direction will the Bayshore blow?